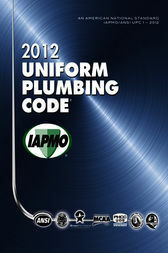 The 2012 edition of the Uniform Plumbing Code (UPC©) represents the most current approaches in the plumbing field. It is the fourth edition developed under the ANSI Consensus process is designated as an American National Standards by the American National Standards Institute (ANSI). Contributions to the content of this code were made by every segment of the built industry, including such diverse interests as consumers, enforcing authorities, installers/maintainers, labor, manufacturers, research/standards/ testing laboratories, special experts and users.